Introduction A key priority in asthma management is achieving control. The Asthma Control Test (ACT) is a validated tool showing a numerical indicator which has the potential to provide a target to drive management. A novel pharmacist-led intervention recently evaluated and introduced in the Italian setting with a cluster randomised controlled trial (C-RCT) showed effectiveness and cost-effectiveness. This paper evaluates whether the intervention is successful in securing the minimally important difference (MID) in the ACT score and provides better health outcomes and economic savings. Methods Clinical data were sourced from 816 adult patients with asthma participating in the C-RCT. The success of the intervention was measured looking at the proportion of patients reaching MID in the ACT score. Different levels of asthma control were grouped according to international guidelines and graded using the traffic light rating system. Asthma control levels were linked to economic (National Health Service (NHS) costs) and quality-adjusted life years outcomes using published data. Results The median ACT score was 19 (partially controlled) at baseline, and 20 and 21 (controlled) at 3-month and 6-month-follow up, respectively (p<0.01). The percentage of patients reaching MID at 3 and 6 months was 15.8% (129) and 19.9% (162), respectively. The overall annual NHS cost savings per 1000 patients attached to the shift towards the MID target were equal to €346 012 at 3 months and increased to €425 483 at 6 months. Health utility gains were equal to 35.42 and 45.12 years in full health gained, respectively. Discussion The pharmacist-led intervention secured the MID in the ACT score and provided better outcomes for both patients and providers. The pharmacist-led intervention secured a minimally important difference (MID) in Asthma Control Test (ACT) score. The proportion of patients on target (MID of 3 points) improved at 3-month postintervention and kept improving after 6 months. Securing MID in ACT score was linked with cost reduction and quality-adjusted life years increase when moving from not controlled to partially controlled, or from partially to fully controlled. Recently updated information from the WHO1 has confirmed that asthma is still one of the major non-communicable diseases, but that medication can control asthma and appropriate management can enable people with asthma to enjoy a good quality of life. Fink and Rubin2 have suggested that management of chronic airways disease is 10% medication and 90% education. Community pharmacists were stratified by regions and randomly allocated to group A, who were trained in and delivered the intervention at baseline, and group B, who received training and delivery 3 months later. The procedure was conducted using a computerised random number generation in blocks of 10. Each pharmacist recruited up to five patients, and both groups (A and B) were followed for 9 months. Data were collected at 3-month intervals (at baseline (T0); at 3 months (T3); at 6 months (T6); and at 9 months (T9)). The primary outcome was asthma control, assessed using the Asthma Control Test (ACT) score (ACT ≥20 represents good control). The secondary outcomes were (1) the number of active ingredients, (2) adherence and (3) cost-effectiveness compared with usual care. Blinding was not possible for either pharmacists or patients. The assessment of outcomes was conducted by a researcher blind to group allocation. For cost analysis we used Vervloet et al 6 cost data on scheduled healthcare visits to their usual physician and specialist, unscheduled healthcare asthma-related inpatient admissions, emergency visits and emergency contacts with a physician. Healthcare provider costs were estimated from an Italian National Health Service (NHS) perspective. Italian societal costs were sourced from Accordini et al.7 Health outcome data, in terms of quality-adjusted life year (QALY), a utility measure of disease burden, including both the quality and the quantity of life, were also sourced from the literature looking at published evidence for the Italian population.8 The cost for delivering the Italian Medicines Use Review (I-MUR) service per visit per patient was estimated as €40; calculations were based on an average cost of similar services provided in different countries (eg, Canada, Switzerland, UK and USA). All cost data were actualised from 2005 to 2015. The average annual cost (NHS and society) and utility estimates per patient across groups were calculated looking at the three asthma control categories (not controlled, partially controlled and controlled) as presented in the framework of analysis below (see the Materials and methods section) and linked to the C-RCT data looking at the patient-level ACT scores as reported at three time points (T0, T3 and T6). The summary cost-effectiveness statistic calculated was the incremental cost-effectiveness ratio (ICER). Uncertainty and variation around the ICER mean were represented by the cost-effectiveness acceptability curve, obtained by resampling the data 1000 times to generate a mean cost and life year or QALY gain from each group, using a non-parametric bootstrap approach. The proportion of resampled data sets for which the calculated ICER lies below a given threshold was interpreted as the probability that the ICER of the intervention is below that threshold. Effective: The median ACT score was 19 (partially controlled) before the intervention, 20 (controlled) at 3 months after the intervention and 21 at 6 months (p<0.01; see online supplementary material 1). The OR for improved asthma control was 1.76 (95% CI 1.33 to 2.33) in patients who received the intervention versus the ones who did not, and the number needed to treat was 10 (95% CI 6 to 28). The optimisation of the number of asthma active ingredients used by patients, which was reduced by 8%, and patients’ self-reported adherence to medication, which increased by 40%. This study had several limitations, among which the evaluation of patients’ adherence was not conducted using a validated tool, but with two questions, for brevity, used also in the English MUR template. The economic evaluation was conducted using secondary data because primary data were not available due to a tight budget. Although the C-RCT evaluation showed a positive impact of the pharmacist-led intervention on asthma control in terms of improved ACT score (defined as change from not controlled/partially controlled to controlled asthma), the researchers did not measure whether patients who improved their asthma control reported the smallest difference in ACT score that represents a clinically significant change (ie, the minimally important difference, MID) of 3 points in the ACT score. The MID in the ACT score of 3 points is a measure identified by Schatz et al,32 who suggested that a 3-point difference or change in ACT is clinically meaningful and such a target should be considered when evaluating the clinical performance of asthma interventions. The focus of the main C-RCT evaluation was to measure the impact of the pharmacist-led intervention on asthma control (in terms of gains in median ACT score) and, following this, possible benefit in terms of cost-effectiveness (see online supplementary material 1 and elsewhere14). The purpose of this paper is to take the C-RCT evaluation a step further and measure the impact of the pharmacist-led intervention on MID in asthma control (looking at the proportion of patients reaching a 3-point improvement (MID) in the ACT score). Given the positive outcomes of the C-RCT in terms of both cost-effectiveness (cost per QALYs) and cost savings for the NHS, we also looked at possible benefits of reaching clinical MID, in terms of both health outcomes (QALYs) for the patient and economic savings for the healthcare provider. Is the pharmacist-led intervention provided to patients with asthma effective in securing the MID in the ACT (assessed by a 3-point difference in the ACT score)? What is the impact of MID on patients’ quality of life and costs to the healthcare provider? The total C-RCT patient population included in the intention-to-treat analysis was 1263.14 A subsample of those (n=816) was used for this analysis (see the C-RCT per-protocol approach).14 The proportion of patients on target was compared between groups at baseline and at 3 and 6 months after. Categorical variables were analysed using χ2 test for independence. The primary outcome was the proportion of patients who reached a 3-point improvement (MID) in the ACT score. Health outcome in terms of QALY. Costs for the healthcare provider (NHS) to include the cost data on scheduled healthcare visits to their usual physician and specialist, unscheduled healthcare asthma-related inpatient admissions, emergency visits and emergency contacts with a physician. Costs were estimated from an Italian NHS perspective. Different levels of asthma control were grouped according to international guidelines33 and graded using the traffic light rating system (figure 1). Following this, the colour-coded asthma control levels were linked to costs (NHS costs) and health outcome (QALY utility) data using the multidimensional data matrix presented in figure 2. The framework of analysis. Cost for the healthcare provider (National Health Service (NHS)): the cost data on scheduled healthcare visits to their usual physician and specialist, unscheduled healthcare asthma-related inpatient admissions, emergency visits and emergency contacts with a physician. Utility score: the gains in health utility (years in full health saved) measured using the Euroqol-5D score, where its values lie on a scale on which full health has a value between 1 (full health) and 0 (dead).8 For the purpose of this testing, the economic data were sourced from Vervloet et al.6 All cost data were actualised from 2005 to 2015. Euroqol 5D, Euroqol 5 dimensions. The asthma control groups and their traffic light rating system. The Asthma Control Test (ACT) is a five-item questionnaire that defines three levels of asthma control according to the Global Initiative for Asthma guidelines. Three specific ranges of ACT sources are reported in the figure.37 Euroqol-5D, Euroqol 5 dimensions. €2727 (95% CI 863 to 4009); €870 (95% CI 306 to 1279); and €394 (95% CI 127 to 579). QALY: 0.62 (95% CI 0.60 to 0.64); 0.71 (95% CI 0.70 to 0.72); and 0.91 (95% CI 0.90 to 0.92). 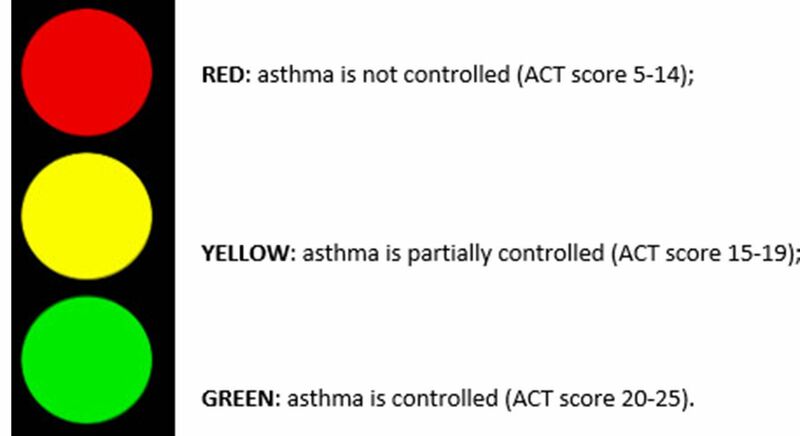 Colour code-specific stages of asthma control (RED) not controlled (ACT scores 5–14), YELLOW partially controlled (ACT scores 15–19) and GREEN controlled (ACT scores 20–25), defined in terms of clinical, economic and health outcome measures (figure 1). 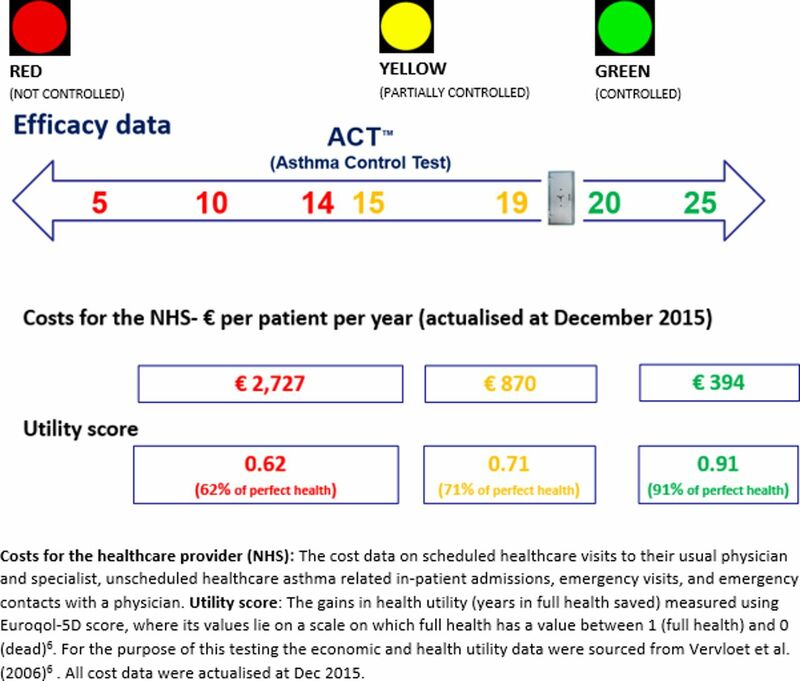 Monitor possible changes in asthma control using a typical sequence of traffic light colour phases (eg, the more asthma is under control (moving from RED to YELLOW, and then GREEN) where less money is spent (in terms of annual costs per patient incurred by the NHS) and also more people are able to experience better health) (figure 2). Specific gains (in costs and health utility) when shifting between different asthma control groups are described in table 1. In order to test whether a gain in ACT score equal to 3 points in ACT score (MID) could have an impact in terms of improved health outcome for the patients (QALY) and cost savings for the healthcare provider (NHS), we considered five different scenarios, described in table 2. The ACT scores obtained from the pooled data set (groups A and B before receiving the pharmacist-led intervention)14 34–36 were considered for analysis, and the proportion of individuals who met the MID target was calculated after 3-month and 6-month follow-up. A reference population of 1000 patients with asthma was established, and the number of patients on target was calculated for the different shifts. For those who reached the MID target of 3 points, the annual cost saving and utility gains were computed accordingly. The number of patients included in this analysis was 816 (pooled sample A intervention+B control; see online supplementary material 1). No statistical differences were identified between A and B groups before the intervention. In the pooled sample the median ACT score before the intervention was 19, at 3 months after the intervention 20 (16–23) and at 6 months 21 (17–23). The differences were statistically significant (p<0.01). The proportion of patients who were on MID target and reached the GREEN group at 3 and 6 months moved from 15.8% to 19.9%, respectively. Online supplementary material 2 presents the subsample of people who met a clinically significant change in ACT score equal to the MID of 3 points for the five different scenarios described in table 2. When looking at a cohort of 1000 patients with asthma, the overall cost savings attached to the shift towards the MID target (ie, the 349 patients who moved towards better control of their asthma and closed the gaps between RED-YELLOW (150 patients) and YELLOW-GREEN (199 patients)) were equal to €346 012 at 3 months and increased to €425 483 at 6 months. Health utility gains translated into additional 35.42 and 45.12 years in full health gained. Figure 3 presents the annual cost savings and utility gains for the five different cases described in table 2. 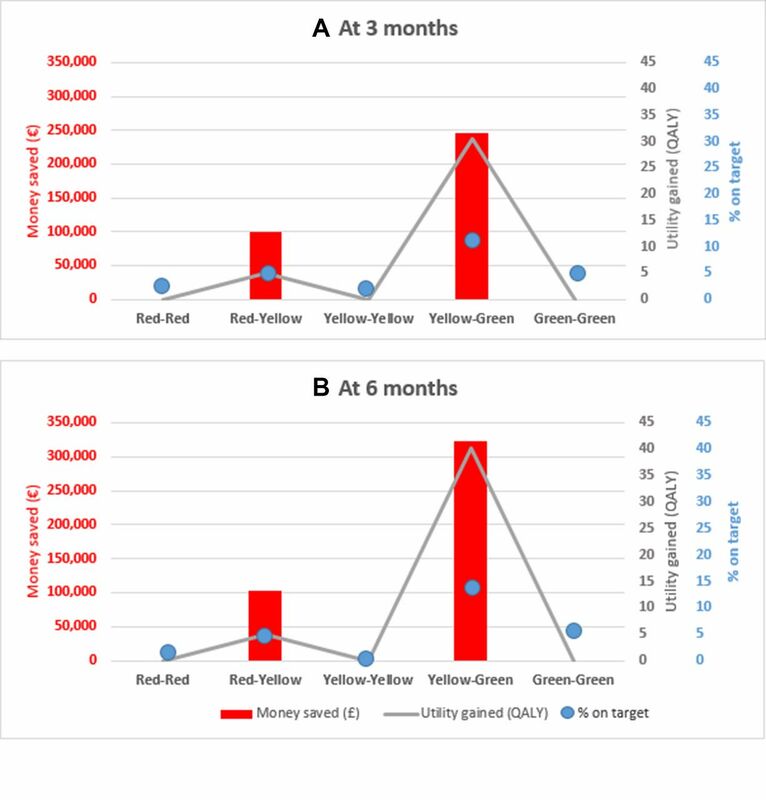 The changes from RED to YELLOW (shift 2) and YELLOW to GREEN (shift 4) presented the highest benefits in terms of % on target, cost savings and utility gains at both 3 and 6 months (figure 3). Proportion of patients with asthma on target, annual cost savings and utility gains when securing clinical target in asthma control (minimally important difference) with the pharmacist-led intervention. Population considered=1000 patients with asthma. QALY, quality-adjusted life years. Part A, results at 3 months; Part B, results at 6 months. This analysis has demonstrated that the pharmacist-led intervention14 can secure an MID in the ACT and in doing so improve patients’ health outcome as well as reduce costs to the NHS. The framework approach to data analysis presented in this paper allows the evaluation of the impact of MID on the ACT score in terms of cost savings for the healthcare provider and gains in health outcome for patients. The introduction of the pharmacist-led intervention and its success in securing a 3-point MID in ACT showed that the economic and utility benefits of better asthma control are evident when shifting from RED-YELLOW and YELLOW-GREEN. Given that the costs associated with controlled asthma are lower than those for managing uncontrolled asthma, any change between not controlled to partially controlled (RED-YELLOW) had greater impact on effectiveness and cost-effectiveness than partially controlled-controlled (YELLOW-GREEN) at 3–6 months of follow-up. The results showed that the pharmacist-led intervention could promote a shift in current practice towards better asthma control, and this was confirmed by the C-RCT evaluation.14 Original C-RCT data showed that the ACT score improved at 3 months after the intervention and went up again at 6 months, suggesting the sustainability of the results. The economic evaluation showed that meeting the 3-point MID target can be cost saving for the healthcare provider, and similar results are confirmed in the literature. For example, Schatz et al 32 showed that on average a decrease in asthma control of 3 points in the ACT was associated with a subsequent 76% increased risk of excess short-acting β-agonist use and a 33% increased risk of exacerbations with significant impact on the socioeconomic costs. Vervloet et al 6 showed that the average cost of asthma management was more than six times higher among patients at the lower levels of the ACT scale with derived ACT score <15 (see figure 2), compared with patients under control, that is, with a derived ACT score of ≥20. A systematic review13 looking at the economic burden of asthma suggested that hospitalisation and medication were the most important drivers of healthcare costs, while work loss accounted for the greatest percentage of indirect costs. Moreover, a multinational cross-sectional survey has suggested that the ACT is a predictor of GINA guideline-defined asthma control.37 Multiple strategies including, for example, education of patients and doctors, as well as regular follow-up, are required to reduce the economic impact of the disease on both direct and indirect costs. Patients’ education was indicated as the most common PCI identified by pharmacists during the C-RCT project,14 where pharmacists followed up their patients for 9 months. As already mentioned Fink and Rubin2 suggested that the management of chronic airways disease is 10% medication and 90% education. This analysis of the MID confirmed that even an improvement of 3 points showed an important contribution in clinical, quality of life and economic terms. The development of the pharmacist-led intervention was informed by the MRC framework. The intervention proved to be an innovative and bespoke service for patients with asthma,14 supported by effective and cost-effective outcomes. An additional strength of the paper is the fact that the framework of analysis is based on the National Institute for Health and Care Excellence guidelines and constitutes an easy tool to monitor healthcare performance in terms of clinical, NHS costs and health utility outcomes. The same framework analysis was replicated using a societal perspective (to include loss productivity at work),7 and similar cost-effective and cost saving results were confirmed (data are available from the authors on request). Clinicians and general practitioners looking after their patients with asthma (as well as their professional organisations) can now evaluate the effect and impact of asthma control on clinical, health and costs outcomes, and measure the success of asthma control both in primary and secondary care. Pharmacists could use this evidence-based approach for the provision of a pharmacist-led intervention which appears to be value for money and can align their services with those of other providers as members of the same healthcare professional team. Patients can achieve better asthma control and quality of life, even with a minimum gain of 3-point ACT score. Following discussions of the C-RCT findings with an audience of policy makers, commissioners and practitioners in Italy,38 UK39 and Europe,40 41 it appears that this bespoke pharmacist-led intervention for patients with asthma presents a significant opportunity for success of improving asthma control if implemented in the real-world setting. The authors thank the Italian pharmacists, general practitioners and consultants, patients and all other people who have been involved in the C-RCT. The authors are grateful to J Krska and T Thomas for their contribution to the C-RCT. World Health Organization, 2017. Asthma fact sheet 307. http://www.who.int/mediacentre/factsheets/fs307/en/ (accessed 13 Dec 2017).
. Problems with inhaler use: a call for improved clinician and patient education. Respir Care 2005;50:1360–74. , 2003. Global burden of Asthma. Global Initiative for Asthma (GINA). http://ginasthma.org/local/uploads/files/GINABurdenSummary_1.pdf (accessed 13 Dec 2017). , 2016. European Lung White book. The economic burden of lung disease. http://www.erswhitebook.org/chapters/the-economic-burden-of-lung-disease/ (accessed 13 Dec 2017).
. Symptom control and adherence are major issues for asthmatic patients: can they be improved and are they linked? Pharmacoepidemiol Drug Saf 2016;25:18–19. Medical Research Council, 2006. Developing and evaluating complex interventions: new guidance. https://www.mrc.ac.uk/documents/pdf/complex-interventions-guidance/ (accessed 13 Dec 2017). Global Initiative for Asthma, 2016. Global strategy for asthma management and prevention. www.ginasthma.org (accessed 13 Dec 2017).
. Better outcomes for the patient, the provider and the society now: this is not a dream, and the pharmacist could help! BMJ 2017.
. The clinical, utility and economic benefits of securing minimal important difference in asthma control test using a novel tool: the ABOVE asthma (achieving-better-outcomes-and-value-for- everybody-in-asthma). BMJ Thorax 2017.
. How to secure better outcomes for everybody in asthma management: The International–Medicines Use Review Health Technology Assessment (International-MUR HTA). Primary Care Respiratory Medicines 2017;27:17008.
. A cluster randomised control trial to evaluate the effectiveness and cost-effectiveness of the Italian Medicines Use Review (I-MUR) for asthma patients. Presented at the Italian conference FarmacistsPiu’ Florence, 2016.
. I-MUR (Italian Medicines Use Review) Effectiveness and cost-effectiveness using asthma as a model. In: Putting CommunityPharmacies at the Heart of the NHS. London, UK, 2016.
. I-MUR (Italian Medicines Use Review) Effectiveness and cost-effectiveness using asthma as a model. In: European Pharmacists’ Professional Forum, Pharmaceutical Group of the European Union. Brussels, Belgium, 2016.
. Person centred research and care: case studies and future opportunities for collaboration, European Medicines Agency. London UK, 2017. Contributors AM developed the pharmacist-led intervention. MT and AM designed the framework of analysis and the multidimensional matrix. AM conducted the effectiveness analysis and MT the economic analysis. MT and AM drafted the manuscript. JW reviewed the output of the analysis, its applicability in the clinical setting and helped with the drafting of the manuscript, and reviewed the manuscript as well. All authors revised the manuscript for intellectual content, and read and approved the final manuscript. The researchers (MT and AM) had access to all data. MT acts as the guarantor for the results. Funding The Italian Pharmacists’ Federation (FOFI) funded the C-RCT. Ethics approval This study was conducted according to the principles expressed in the Declaration of Helsinki. The study was approved by the University of Kent Faculty of Sciences Research Ethics Advisory Group for Human Participants on 18 February 2014 (reference no 0281314). Then it was approved by the Brescia Ethics Committee in Italy on 3 June 2014 (reference no 1710-Studio RE I-MUR), which also acted as the coordinating centre in Italy. Data sharing statement Data supporting the conclusions of this article can be found in the University of Kent Academic Repository (KAR).